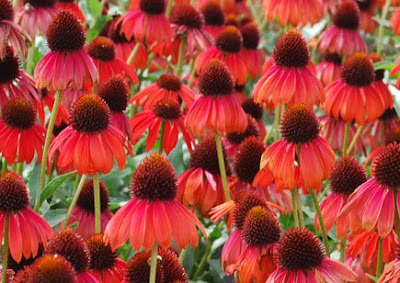 Echinacea 'Firebird' is a great new addition to the coneflower lineup. Although the color may not be different than many of the new varieties, the "shuttlecock" shape of the flower does give it interest and dark cones against the red are eye catching. It reminds us of pallida but it doesn't look quite as dainty and of course, a much more interesting color.